The concept of ‘self’ is as woolly as that of ‘spirituality’. 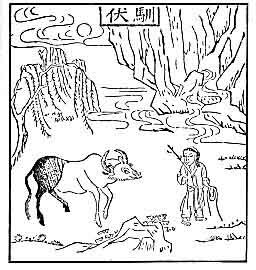 In his book Riding the Ox Home (London, 1982), Willard Johnson helps come to grips with relationship of the psychologised ‘self’ to spirituality using the ancient Taoist parable about the ox tamer on the Zen path to enlightenment. The story begins with the ox tamer and his missing ox. The ox tamer isn’t sure whether his ox is lost or he just can’t see it. Either way he’s unhappy for all the traditional things that should bring him happiness do not. Intuitively the ox tamer knows only his ox will bring meaning to his life so he sets off on the first part of his journey, the goal of which is to tame his ox. Traditionally, the ox symbolises the ultimate, undivided reality, the Buddha-nature that is the ground of all existence. The ox tamer symbolises the part of the ‘self’ that initially indentifies with the individuated ego, separate from the ox. However with progressive enlightenment, the ox tamer finally comes to realise the fundamental reality – he and the ox are – and always have been – one. Psychologically, Johnson suggests that the ox tamer represents that part of the self that makes choices and acts in accordance with them. At the beginning of the ox tamer’s spiritual journey, this ‘self is immature and uncertain of its place in the world. This nascent (and easily manipulated) self, sees everything as in service to it needs; the world is to be exploited for its pleasure. According to Johnson, to achieve maturity we must overcome this infantile self unless we wish to die unfulfilled having known life only from the perspective of our animalistic needs. In turn, the ox represents the ox tamer’s psychologically deeper self – his daemon or inner voice, which keeps his more immature self in check. As with most Eastern religions, to lose one’s ‘self’ is to rediscover a deeper ‘self’ that will become his orientation to reality. In most Western religions, this deeper self corresponds at least in part, with God of the Divine. In the west, generally it is only mystics who achieve unification with this other dimension of self and as they well know, this requires more than just finding and taming one’s ox. Playing his flute, the triumphant ox tamer rides home on his ox. Having tamed his ox (i.e. his need for self-gratification) he is free to express his creative energies in the celebration of life. He has won the battle for self-knowledge; he knows that he himself created his ox through his thoughts. After taming his ox, the ox tamer hears his inner voice – he has found his true home. But the ox tamer is not yet finished. In next part of his journey he must say goodbye to his ox and leave it behind. In both Zen and Western mystical traditions, the goal is not just to tame the self but instead to transcend it. This is the essence of spirituality in the ultimate sense. I suggest this requires more time, space, and personal commitment than most spirituality seekers are able and willing to devote. Instead, I suggest that their goal is more like that of the first part of the ox tamer’s journey – the taming of their egoist ox. The key point is that we confuse the two at our peril. While psychology does offer us knowledge about ourselves as human beings, it has not yet been shown to offer us any knowledge about God. [i] For more information see Carrette and King’s Selling Spirituality – The Silent Takeover of Religion, (Routledge, 2005). [ii] For more information see Passage to Modernity – An Essay in the Hermeneutics of Nature and Culture (Yale University Pres, 1993)by Louis Dupré. Next article In the Age of Aquarius What Happens to God?